For Yacht Travelling from the Furthest Port to Compete, the Polish Trophy to Weddell (Afanasy Isaev). First Boat under 9.5m LOA across the Finish line – the Plum Crazy Trophy to Maluka of Kermandie (Sean Langman). For most meritorious performance as judged by the race committee, the Rani Trophy to HotelPlanner.com, Conall Morrison. First Yacht Out of Sydney Heads, the Jack Rooklyn Memorial Trophy and Replica to Black Jack (Peter Harburg). First Yacht Due South of Tasman Island, the F and J Livingstone and Replica to LDV Comanche (Jim Cooney). Third over the Line, Black Jack (Peter Harburg). Second over the Line, Wild Oats XI (The Oatley Family). Line Honours and race record for the J.H Illingworth Trophy and Replica to LDV Comanche (Jim Cooney and Samantha Grant). Rolex Yacht Master Timepiece to LDV Comanche (Jim Cooney). Third Clipper 70 Division, Garmin (Gaetan Thomas). First female skipper for the Jane Tate Memorial Trophy and second Clipper 70 Division, Sanya Serenity Coast (Wendy Tuck). First Clipper 70 Division, HotelPlanner.com (Conall Morrison). First Cruising Division, Charlie’s Dream (Peter Lewis). First Corinthian Division for the York Family Trophy, Snowdome Occasional Coarse Language Too (Warwick Sherman). Chief Executive Officer of TasPorts Paul Weedon presented the following trophies. First Tasmanian boat on IRC for the TasPorts Trophy, Oskana (Michael Pritchard). Navigator of the first Tasmanian Yacht on corrected time for the City of Hobart Trophy, Oskana (Jason Wilkie). Third PHS Division 2, Takani (James Whittle). Third Corinthian Division and second PHS Division 2, She’s the Culprit (The Culprit Syndicate). First PHS Division 2, Flying Fish Arctos (Flying Fish Online). Second PHS Division 1, Abracadabra (James Murchison). First PHS Division 1 for the RANSA Trophy, Helsal 3 (The Helsal 3 Syndicate). First ORCi Division 4, Mister Lucky (Mark Hipgrave). Third ORCi Division 3 and second Corinthian Division, Eve, (Steven Capell). Second ORCi Division 3, Black Sheep (Derek & Martin Sheppard). First ORCi Division 3 for the TasPorts Trophy, Calibre (Richard Williams). The honourable Will Hodgman MHA, Premier of Tasmania presented medallions for 25 races to Jeremy Rae, Ian Davis, James Permezel and David Blanchfield. He also presented Tony ‘Ace’ Ellis with his 50 race medallion. Third ORCi Division 4 and third IRC Division 4, China Easyway (Travis Read and Tim Wilson). Second ORCi Division 4 and second IRC Division 2, Dorade (Matt Brooks). First small boat across the line for the Battery Point Trophy and first IRC Division 4 for the Sir Arthur Warner Trophy, Banque de Nouvelle-Caledonie (Michel Quintin). Third IRC Division 3, TSA Management (Tony Levett). Second IRC Division 3, Mayfair (James Irvine). First IRC Division 3 for the RORC Trophy, Ariel (Ron Forster and Phil Damp). Third IRC Division 2, Chutzpah (Bruce Tayor). Second IRC Division 2 and third ORCi Division 2, Concubine (Jason Ward). Third IRC Division 0, Beau Geste (Karl Kwok). Third ORCi Division 1 and second IRC Division 0, Mascalzone Latine 32 (Vincenzo Onorato). First IRC Division 0 for the Rushcutter Trophy, Wizard (David and Peter Askew). He recalled the man overboard incident that occurred on board Invictus Games 2018 Down Under, and praised the performance of HotelPlanner.com in their recovery procedure. First Armed Services Yacht on corrected time for the Oggin Cup to Invictus Games 2018 Game On (Clipper Ventures). Second ORCi Division 2, first IRC Division 2 (Peter Allsop Memorial Trophy) and third IRC Overall (RYCT Trophy and Storm Bay Cup) Patrice (Tony Kirby). First ORCi Division 1 (Charleston Trophy), second IRC Division 1 and second IRC Overall (City of Hobart Trophy, Bass Strait Cup and Solo Trophy) Quest (Bob Steel). Designer of Winning Yacht for the Alana Payne Memorial Trophy, Marcelino Botin. Navigator of the winning yacht for the Bill Owen Memorial Trophy to Will Oxley. 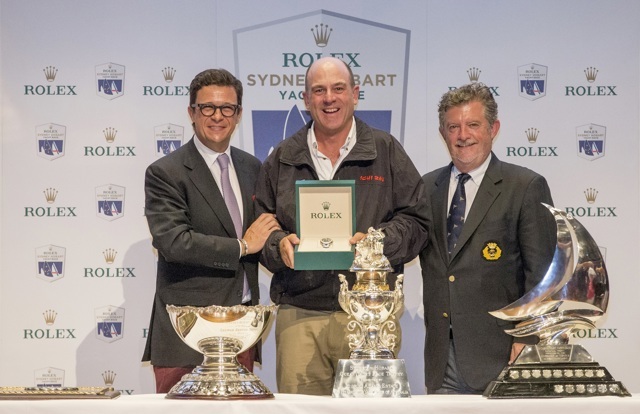 General Manager of Rolex Australia, Patrick Boutellier, presented Matt Allen of Ichi Ban his array of trophies for second ORCi Division 1, first IRC Division 1 (George Barton Trophy), first IRC Division 1, and first yacht under 18.5m LOA across the finish line (Apollo Trophy). Patrick then presented Matt for first IRC Overall the Tattersall Cup, RORC Plaque, Government of Tasmania and the Rolex Yacht Master Timepiece. “Thank you to my crew, they did an incredible job. We were being pushed to the limit by a number of boats, I’ve never seen a bunch of people work so hard for the boat, and so hard for each other. “Please put your hands together for the boat owners of this race, because without any boat owners, there would be no race." “The Rolex Sydney Hobart Race is in my DNA, and we’re going to keep coming back, don’t you worry about that!” he ended. The Cruising Yacht Club of Australia congratulates all winners and each and every competitor in the Rolex Sydney Hobart Yacht Race 2017. We look forward to seeing you on the start line in 2018.